Everyone knows Chick-fil-A. Everyone. So I decided to shed some light on their advertising, specifically, the cows. 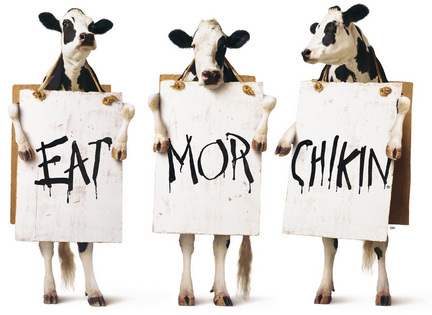 When I think of Chick-fil-A, I automatically think of the cows. The cow campaign started in 1995 and has since taken off to reach millions. They have produced some great 3-D billboards, along with some funny commercials. I am just going to focus on the billboards. I will start with the standing cows carrying a sign. This is their slogan carried by the cows. When you see this, you think Chick-fil-A and you do not have to think twice. This slogan has become very popular with them and I do not see it going anywhere anytime soon. 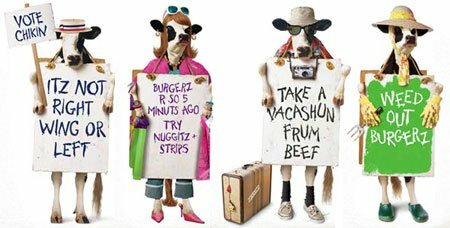 Below are some more cow advertisements. All of them are saying the chicken is better than beef. 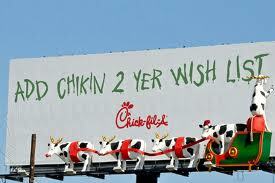 Next, we have a cow that advertises a free chicken sandwich. The catch? You have to dress like a cow. This is a popular day for Chick-fil-A and grabs a lot of attention. 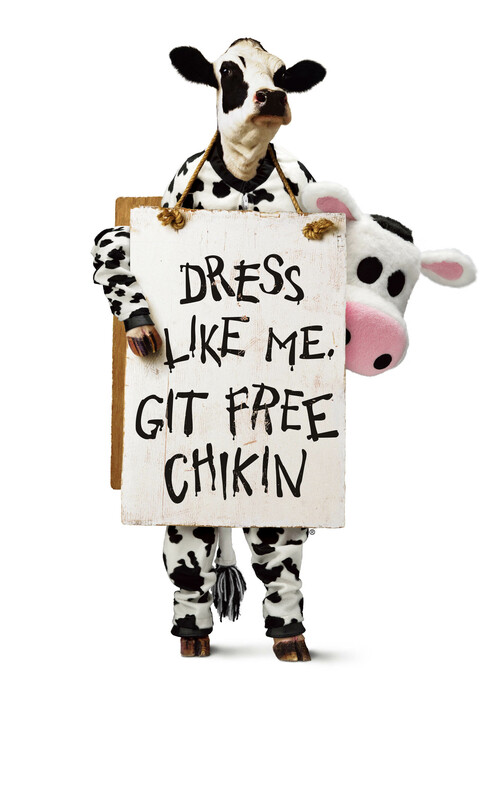 You will see tons of people dressing up like a cow just to get some free chicken. They even have their own cow mascot who comes around the restaurant and interacts with the children. And now we have their infamous billboards. 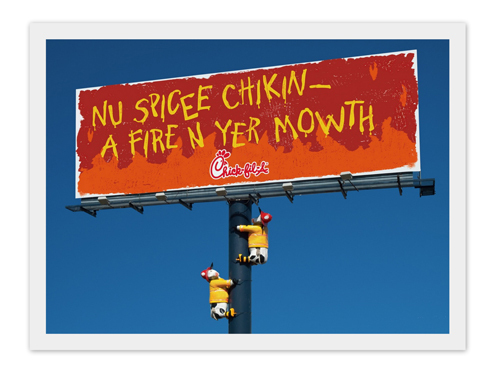 The first one is advertising their new spicy chicken sandwich and the cows are firefighters because that is what you will need to put that fire out of your mouth. The second one is for their delicious shakes. All you need to wash down that chicken is a shake and they have a few flavors to choose from. The third is just one of those funny ones you see while driving on the interstate. 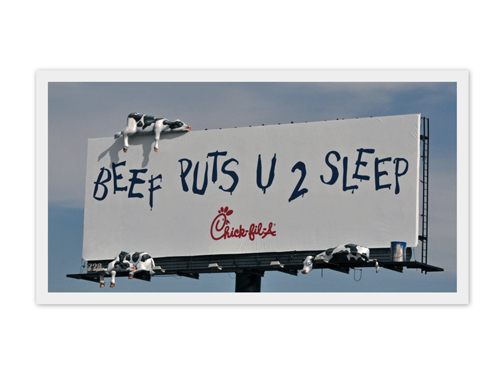 It says if you eat beef, you will fall asleep and that is not good when driving long distances. Notice the sleeping cows?? Lastly on the billboards, they do seasonal ones. Here are a couple from Christmas time. The first one is a play off the lyrics, “the weather outside is frightful” from the song, “Let It Snow”. The second one is the cows being santa and his reindeer. Add chicken to your wish list and Santa is sure to come. 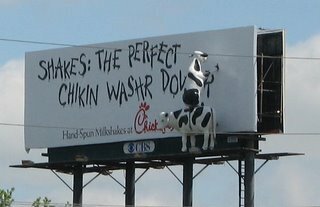 I love Chick-fil-A and I love those cows. It would be a sad day if they retired. 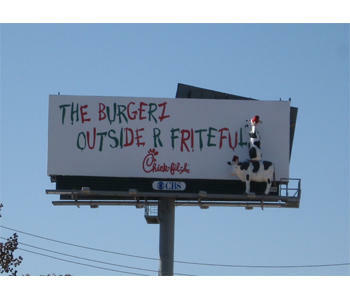 Notice the cows’ spelling?? That’s what makes it more realistic to me. 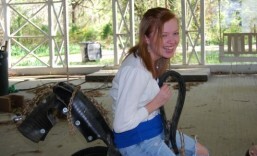 If you want to read another blog post on this cow campaign, go here.